I've always read and wrote poetry, but now as a youth services librarian, I love sharing it with kids at the library whether through a special storytime or a book spine poetry program. Using poetry, with friends, writing it, and sharing with all the teachers with whom I work. (I'm a lit coach at my school.) Thanks for sharing more information about Joan, Tricia! Hi Linda, I've enjoyed reading your poetry--keep writing! Thanks for "touring" with me this week. Where do you teach? I teach at an Independent School called The Logan School for Creative Learning, Joan, in Denver. It's a joy, did middle school for many years & now working with all the ages K-8. Thanks for asking! I am writing, have for a long time with students and personally! Bridget, hooray for you for sharing poetry with young readers--you're giving them a wonderful gift! Tricia, thanks so much for hosting today on my Blog Tour--your blog is such an amazing resource! What a treat to stop by early for Poetry Friday and find this post. I also read Joan's prompt on Teaching Writers. My favorite quote from this interview is " we must embrace our creativity, our uniqueness, and weave it into our lives; we are all richer for it" I am richer having read this post. Now I'd love to read her book, too. I am a huge fan of poetry forms. In April, my class and I take on a different form each day. Thank you, Margaret, for your kind words! Wow, a different form each day--you and your class are adventurous indeed! Like Margaret, I'm happy to have discovered this post since this book sounds like quite a treat! Hi Michelle, it's a treat to read your comments--thanks! What a great idea for a character. I can't wait to read this book! Thought it would be fun to do the "opposite" of Writer's Block! But wait until you see what finally brings Ryan to a halt . . . . I love Joan's work--can't wait to read this one! This sounds fabulous! I was totally thinking Math Curse even before you mentioned it! Can't wait to get this one into my classroom! I have used poetry to save my own life. It makes me a better human by helping me linger in mystery and pay attention to the world. Thanks for the giveaway! As a teacher, I used poetry to introduce students to the music of language. Now as a nonfiction writer, I use poetry to remind myself to look everywhere for the details. Poetry soothes the soul and engages the heart. This book sounds just wonderful. Poetry is one form of writing that has helped me find my own voice, although I like writing in other people's voices, too. I loved everything about this. 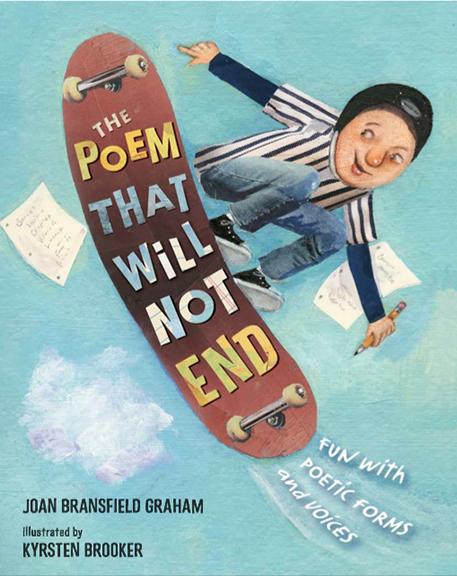 Thanks Joan and Tricia for all that you do for children's poetry! I really enjoyed reading this book aloud to the children. She did a fantastic job and the illustrations are wonderful.